Transform Your Workspace - The Ergotech 100-D16-B03-TW comes standard with a lifetime warranty, assuring you that they believe in their product and stand behind it 100%. Available in a range of mounting options, all Ergotech monitor desk stands are made of steel and aluminum construction and come equipped with Ergotech's patented Quick Release Pivots for easy, instant setup and adjustment. 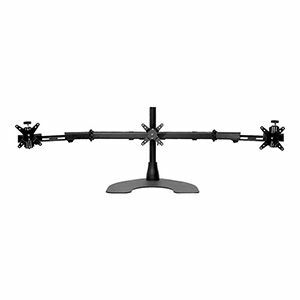 Holds Up to Three, 27" Monitors - The available Telescoping Wings give you 5 extra inches extension on each side of the arm, allowing you to mount up to three 27-inch monitors on the triple monitor stand. Low Profile - The heavy-duty desk stand is low profile, allowing you to save desktop space while enjoying the use of up to three monitors. Customize Your View - The Height Adjustable Pivots allow you to perfectly tile monitors across and choose your own custom viewing angles and allow for tilt +20/-10 degrees and tilt left/right 25 degrees. Ergotech Group, Inc logos are registered trademarks of Ergotech Group, Inc. All others trademarks and copyrights mentioned herein are the property of their respective owners.